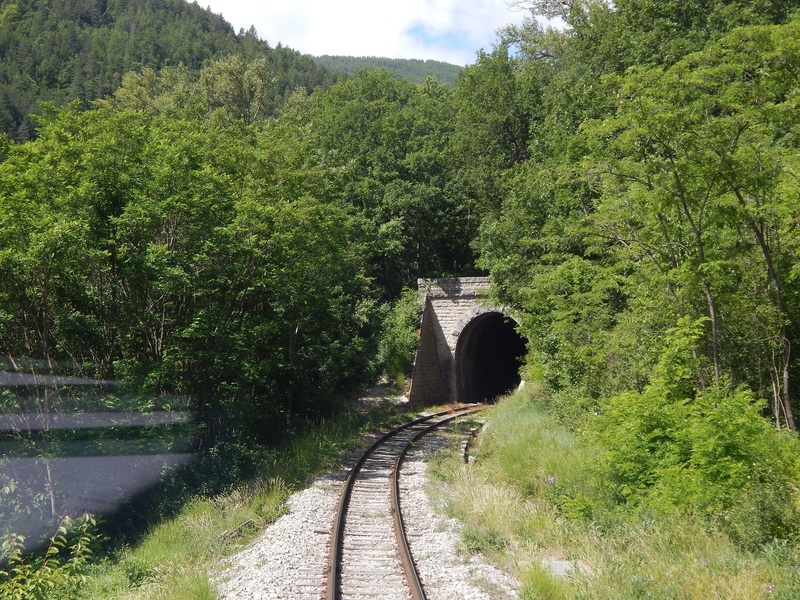 The first two significant structures on this section of the line are a bridge which carries the N202 over the railway and then the Tunnel de Saint Benoit which is also known as the Tunnel du Pont de la Reine Jeanne and is curved in plan and 110 metres long. 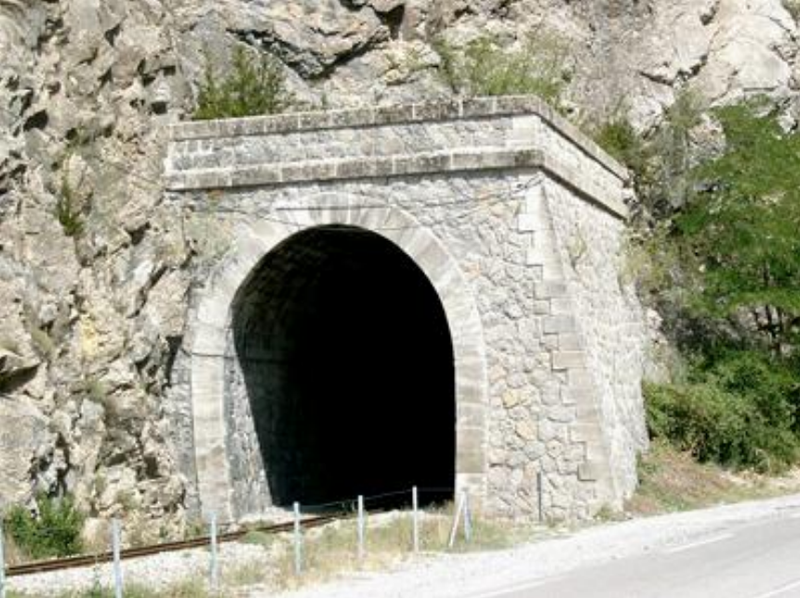 This tunnel’s north-east portal is a matter of metres from the road bridge. 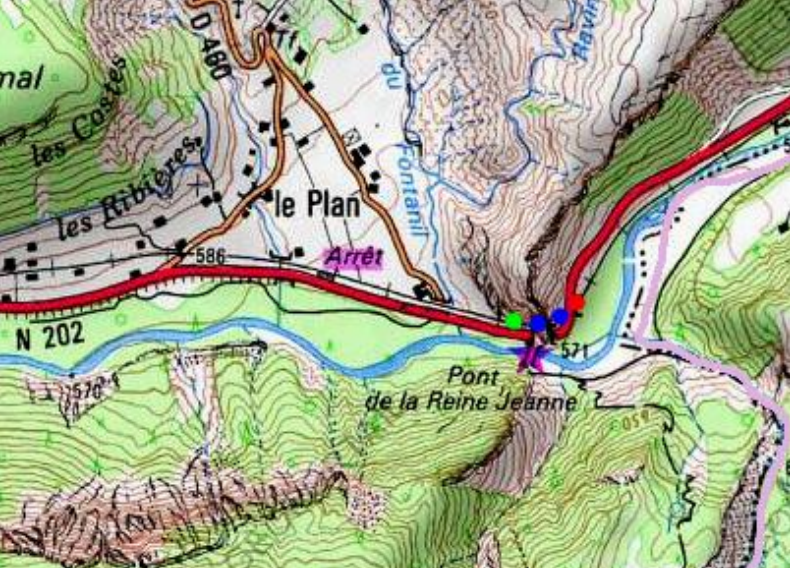 The bridge is located under the red dot on the map below and the tunnel is marked by the blue and green dots. 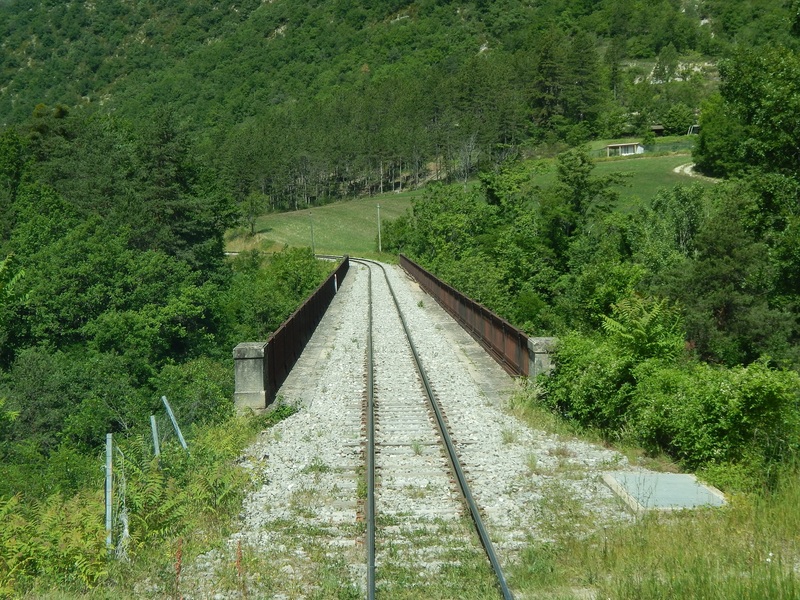 The steel or wrought iron road bridge shown above  has now been supplemented by a more modern structure (below). 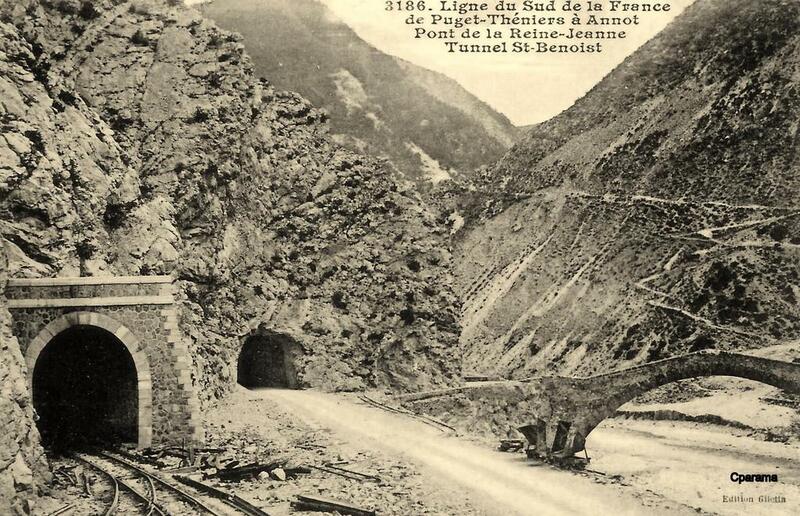 The western portal of the tunnel is shown is the various images below. 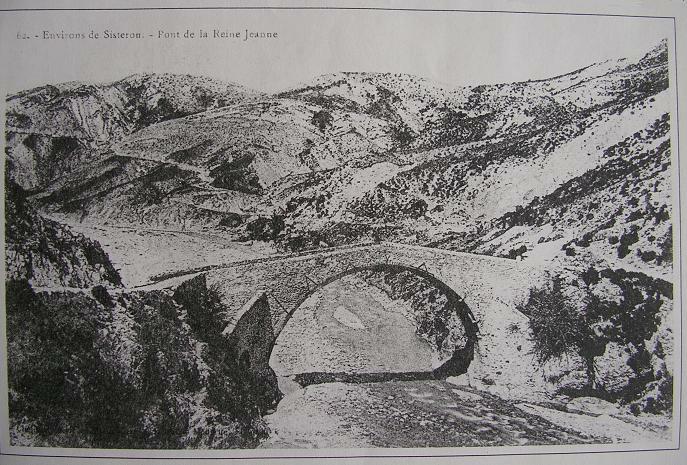 The monochrome image is an old postcard which shows the railway and road tunnels alongside the bridge which provides the alternative name for the tunnel – Tunnel du Pont de la Reine Jeanne. 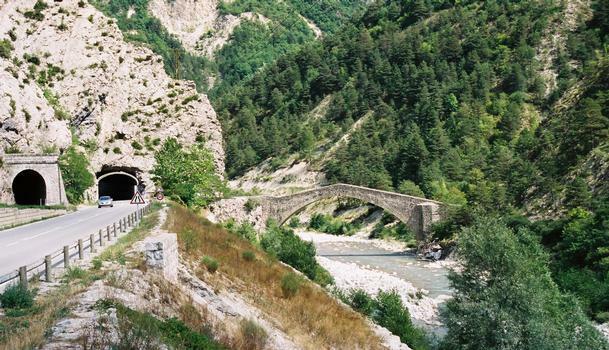 The following two images are of the same bridge. 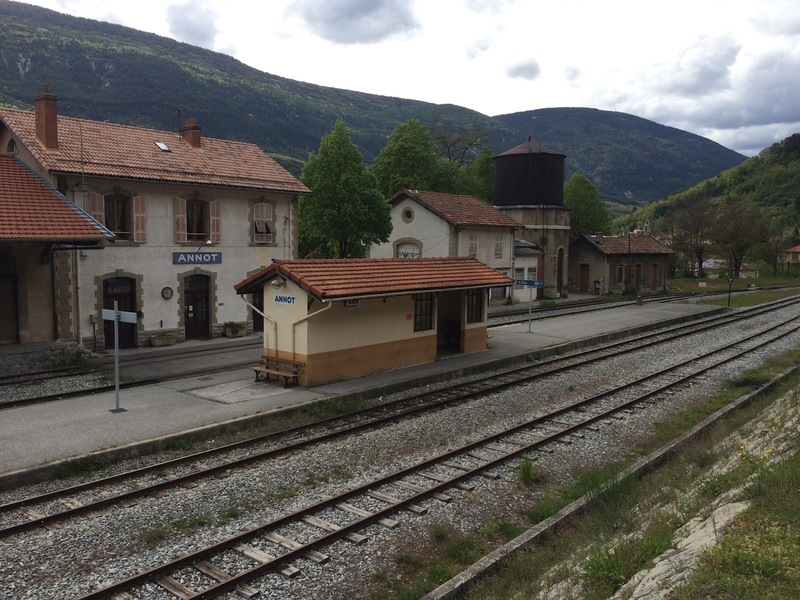 The first comes from the era before the construction of the railway and is taken from upstream of the bridge. 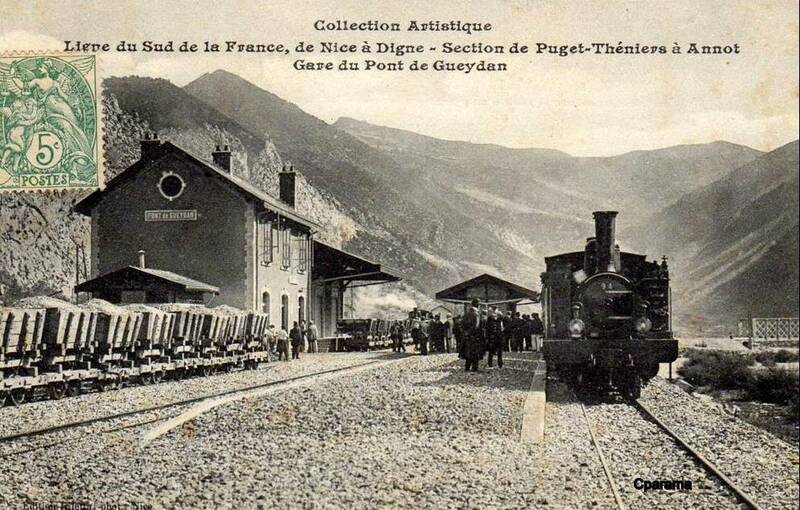 The second comes from the modern era and shows much the same view as the older image above this text. 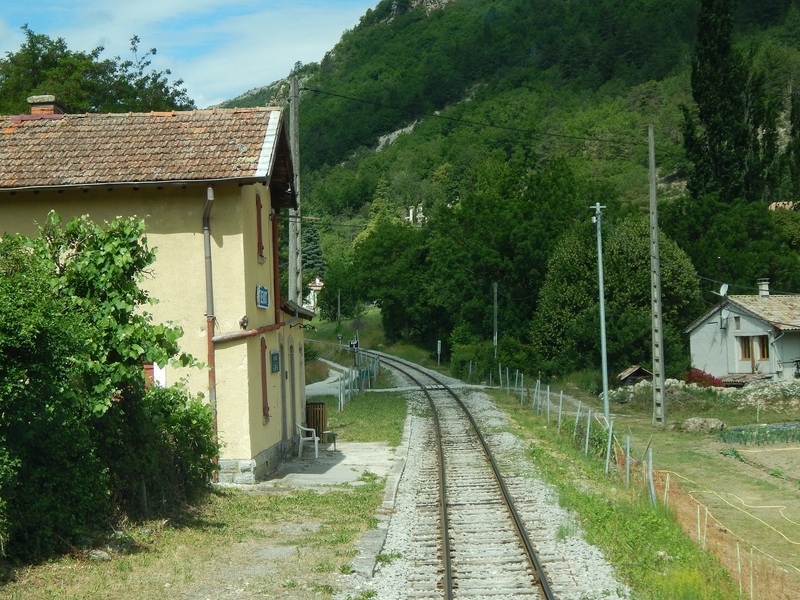 It is also taken from upstream of the bridge. 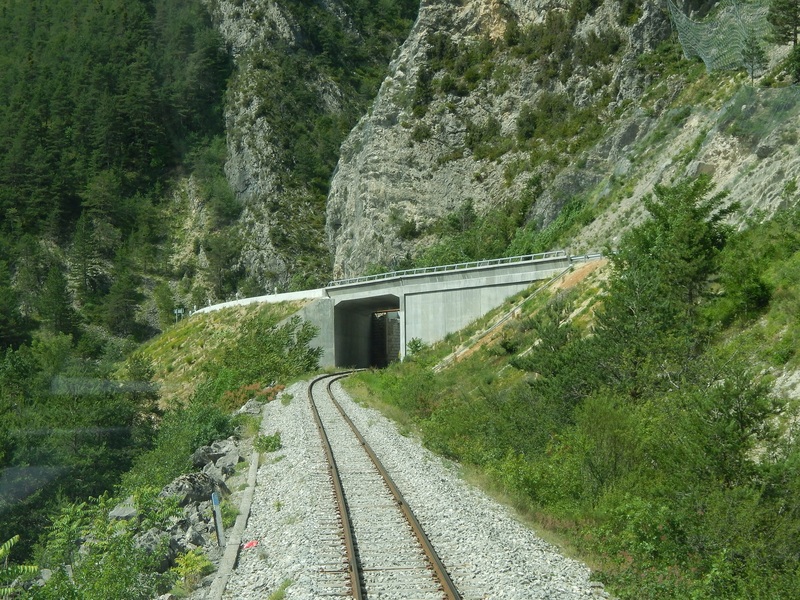 Beyond the tunnel, the railway runs parallel to the N202 on its North side until reaching the halt at St. Benoit. 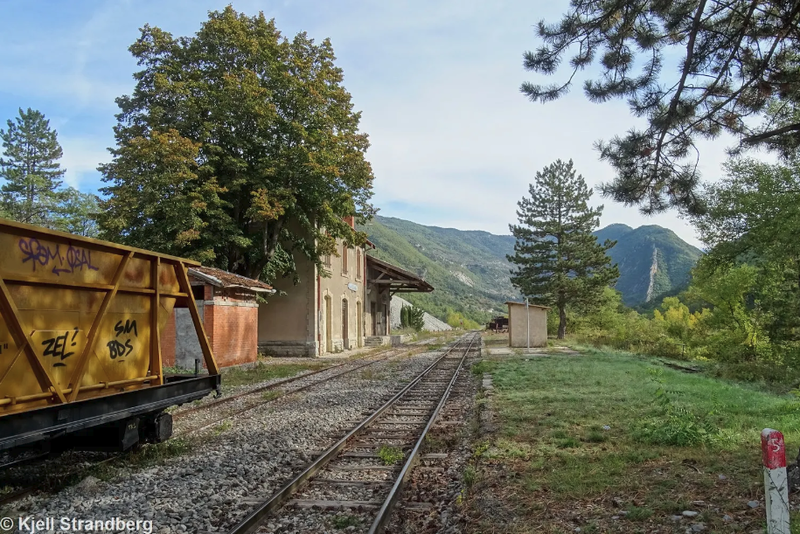 The two pictures above are the remainder of a sequence of photographs from this source which have taken us along the first length of the line to the west of Saint Benoit Pont de Gueydan to the next stop on the line – Saint Benoit Halte  Saint Benoit Halte before refurbishment. 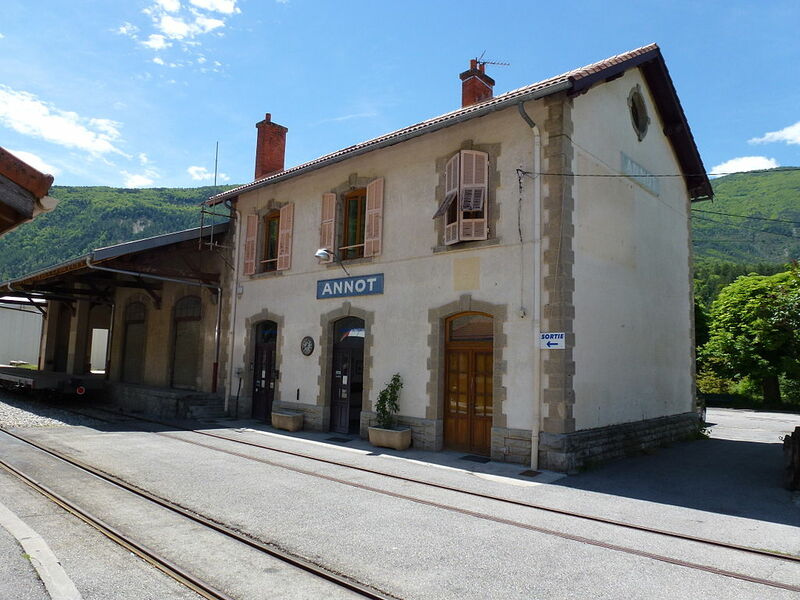 Saint Benoit Halte after refurbishment. 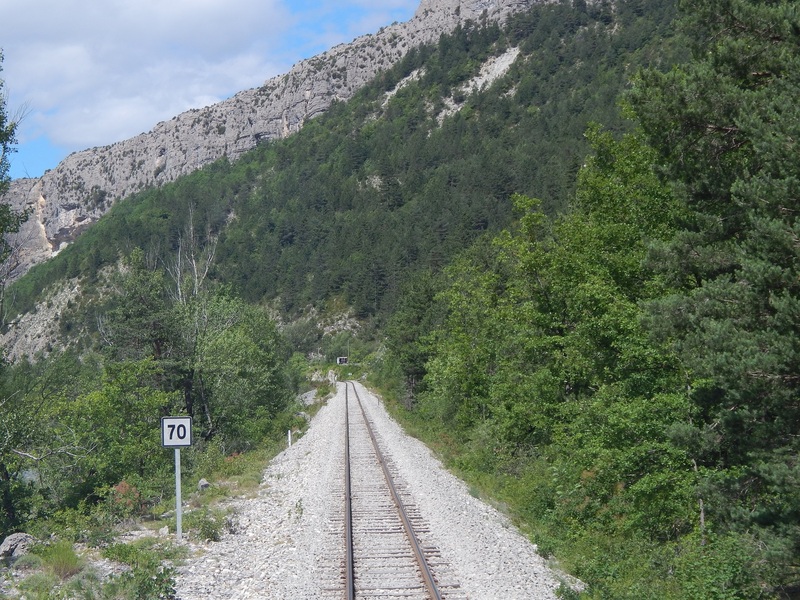 The two pictures above are taken about 1 kilometre beyond Saint Benoit Halt. 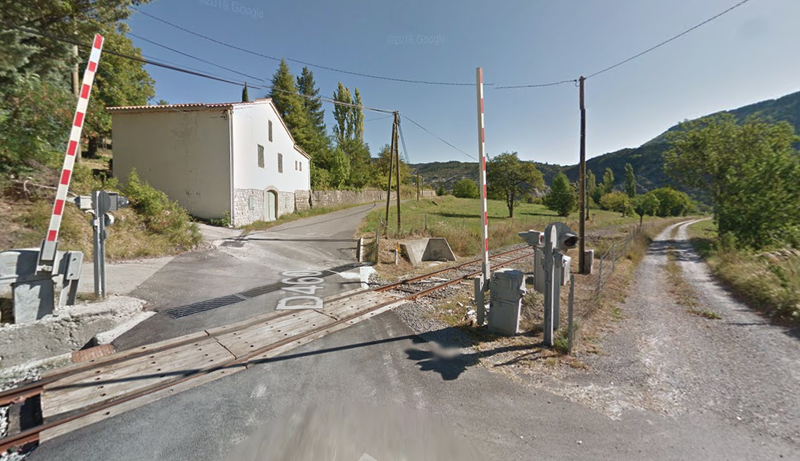 The track to the right of the crossing on the first image is the access road to Saint Benoit Halt. 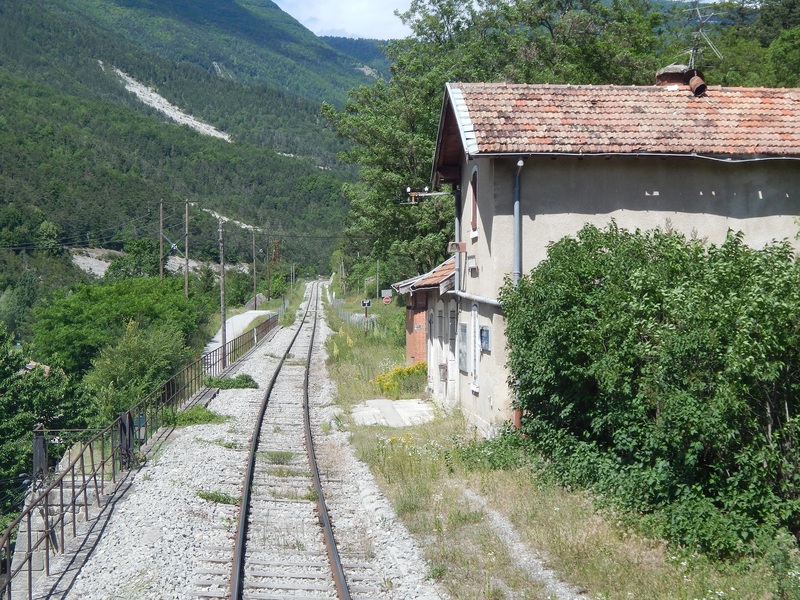 The line continues west alongside the small retaining wall shown on the second image. 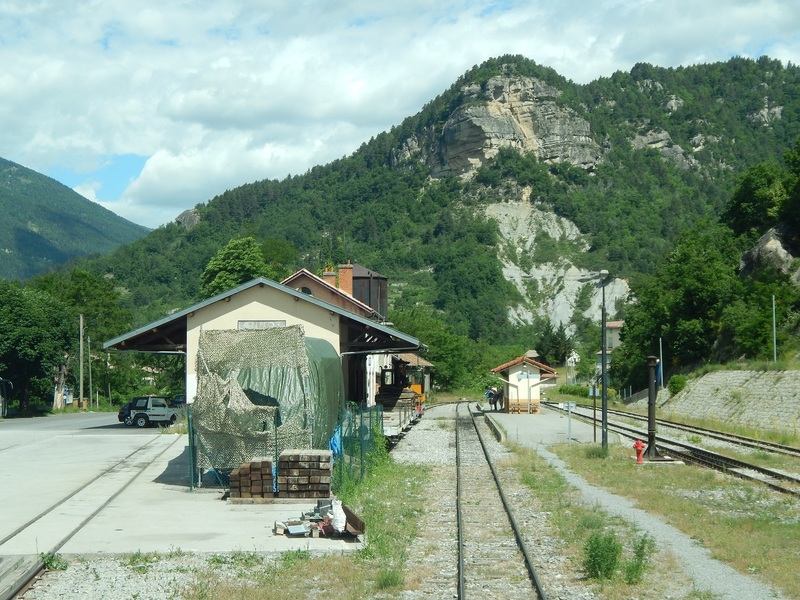 It then follows the N202 until reaching the next ravine – Ravin de Gross Vallon. On the road it is hard to even notice the ravine. 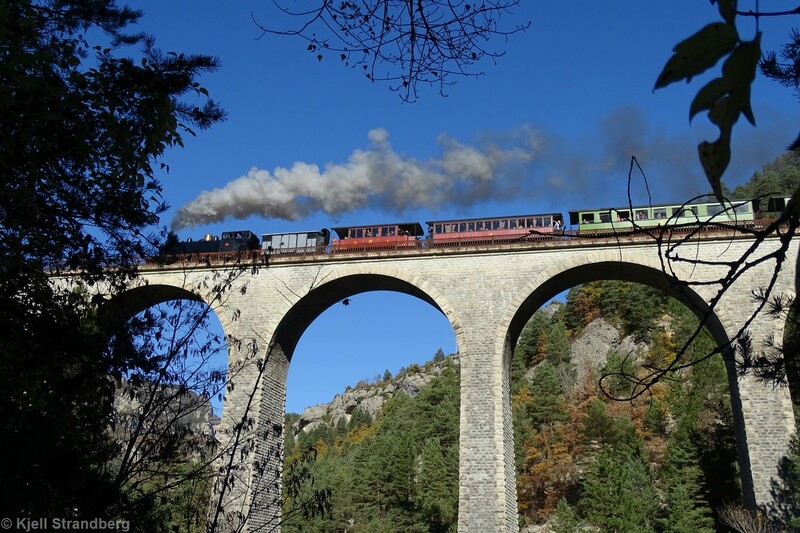 On the railway the bridge is easy to identify. 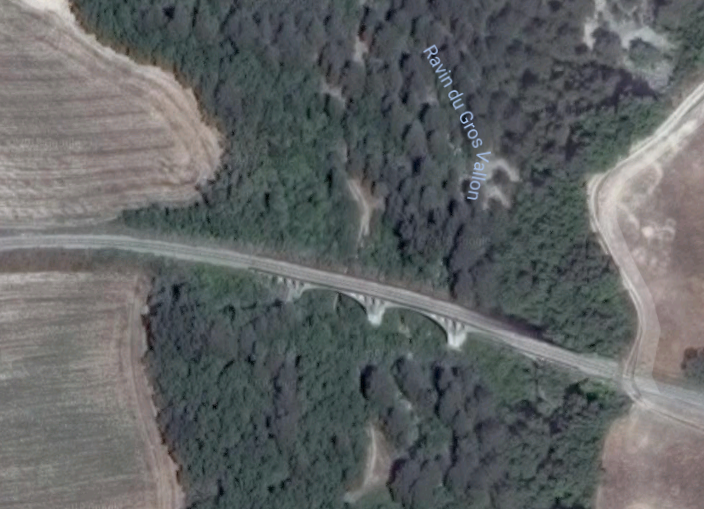 From the N202, the viaduct can only be glimpsed through the vegetation. 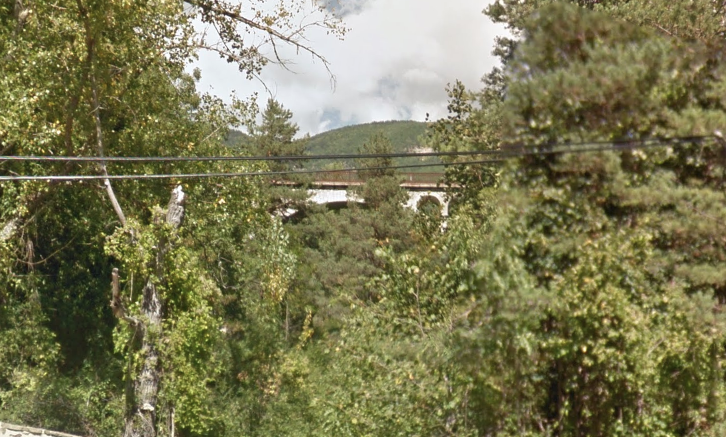 Google Earth provides the best view of the viaduct that I have been able to find. 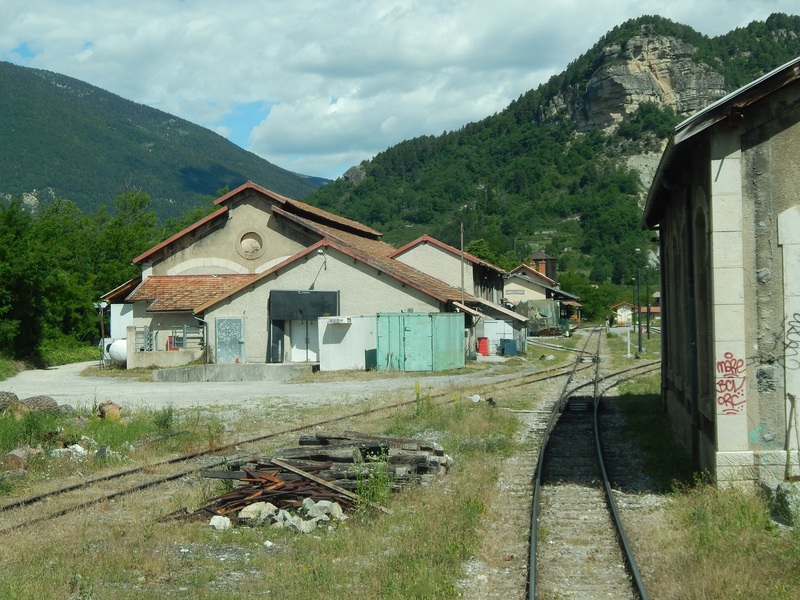 The railway continues about 100 metres north of the N202 for a further kilometre before encountering another tunnel – Tunnel du Plan de Coulomp. 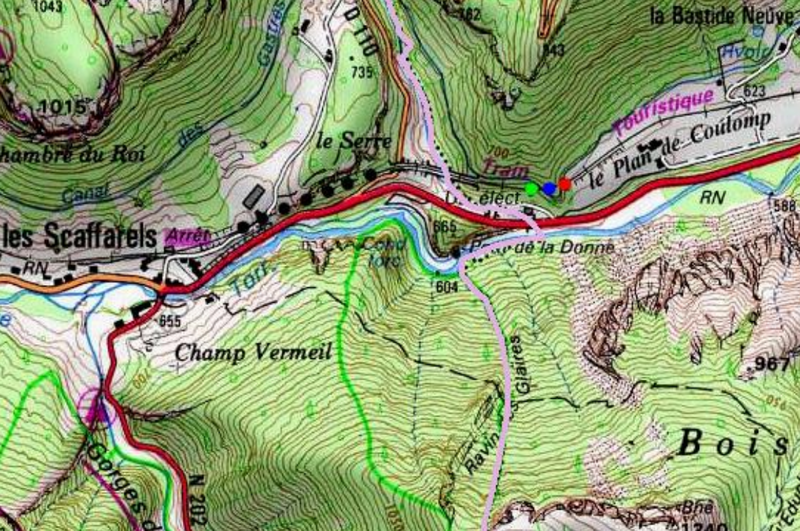 The Tunnel du Plan de Coulomp is shown on the map below by the red, blue and green dots. 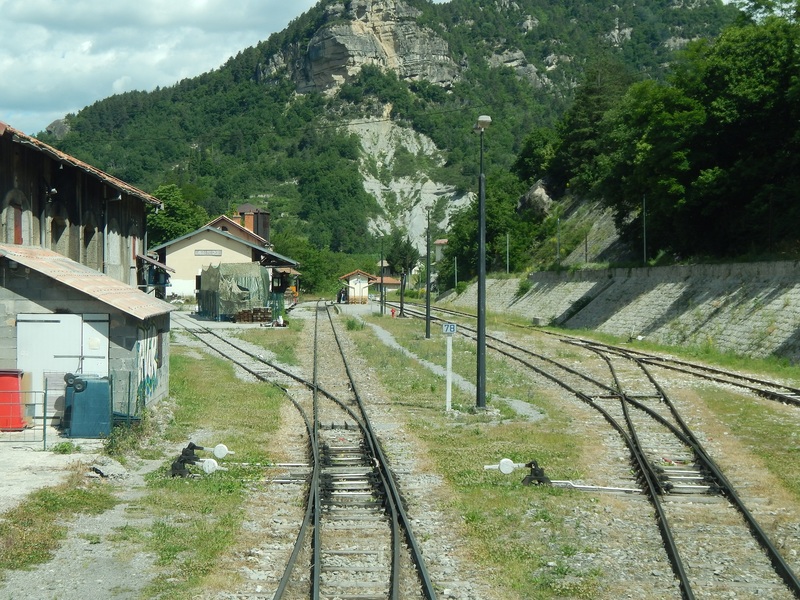 It is 75 metres long and is followed immediately by another viaduct and another two tunnels which are shown by a series of back dots on the map. 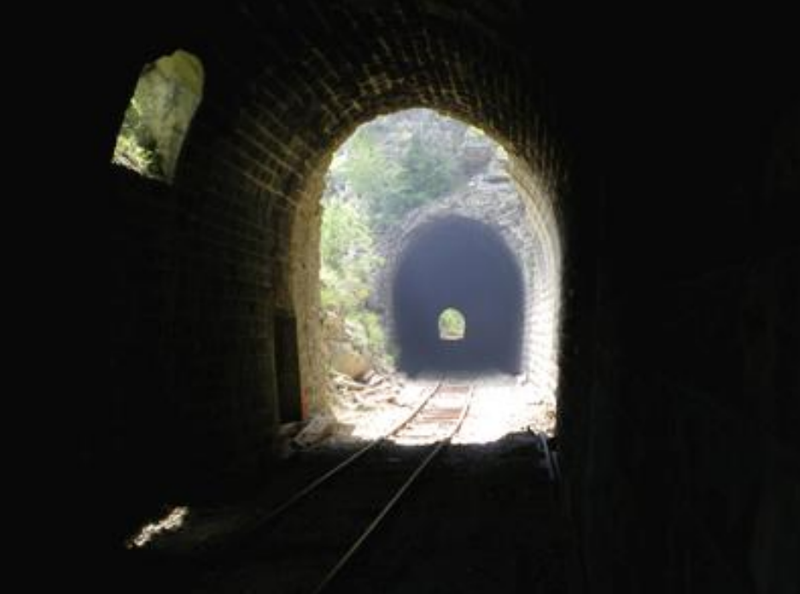 These tunnels are known as Scaffarels Nos. 1 and 2. 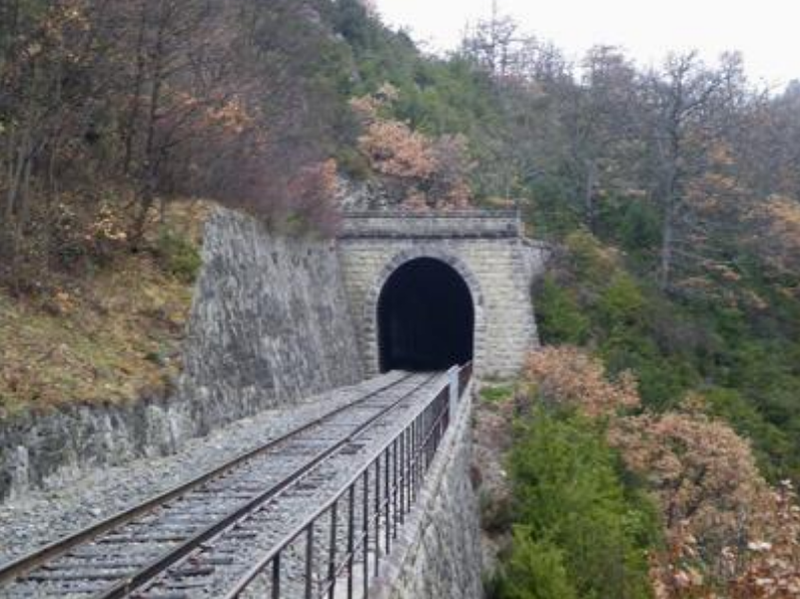 The eastern portal of the tunnel du Plan de Coulomp. 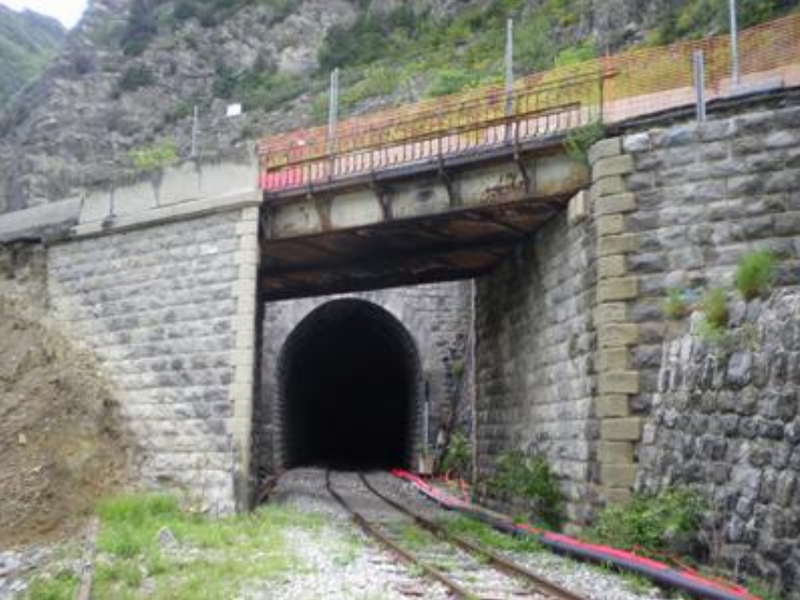 The western portal of the Tunnel du Plan de Coulomp. 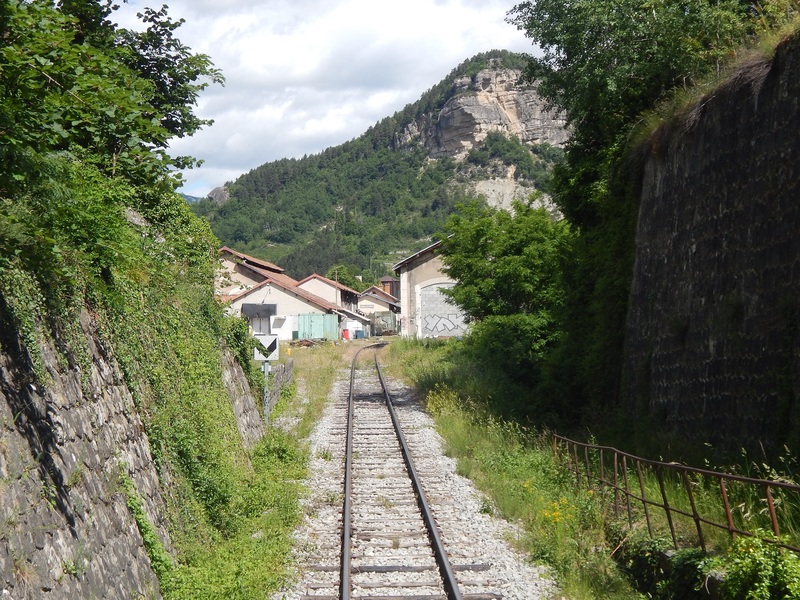 The picture also shows the retaining wall which supports the formation of the railway on the approach to the next viaduct. 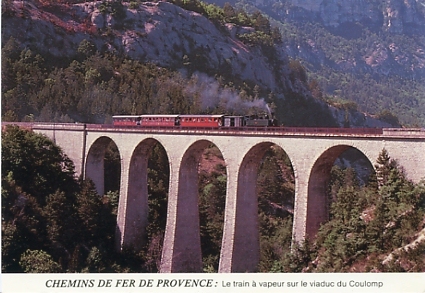 The view of the viaduct over Le Coulomp. 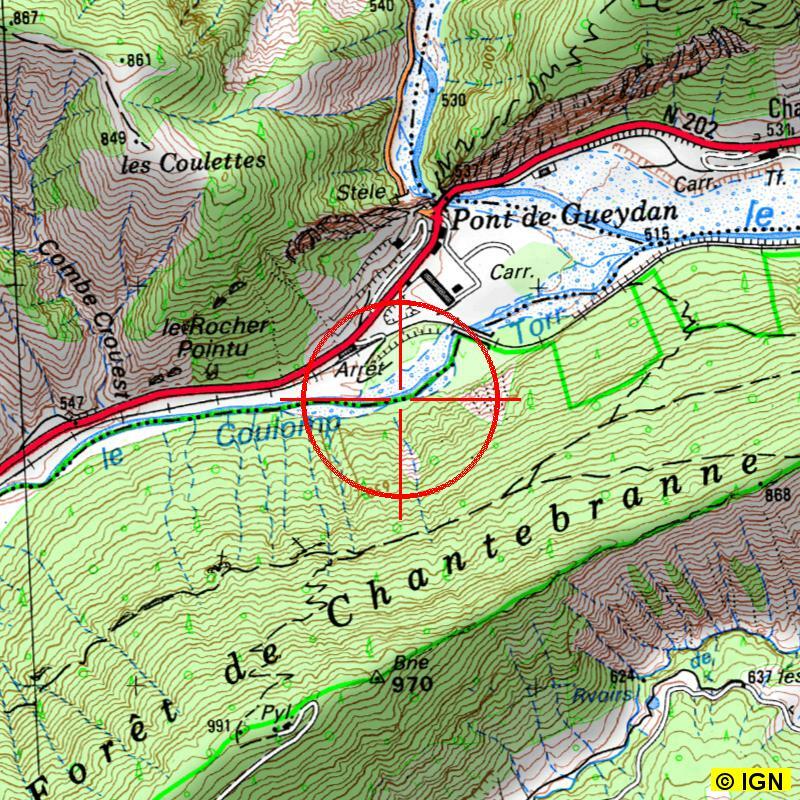 The picture is taken from the N202 which itself is relatively high above the river. 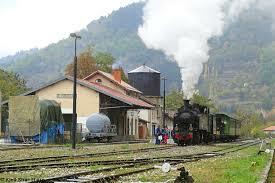 The Portuguese steam locomotive owned by GECP pulls a train over the viaduct heading for Annot. 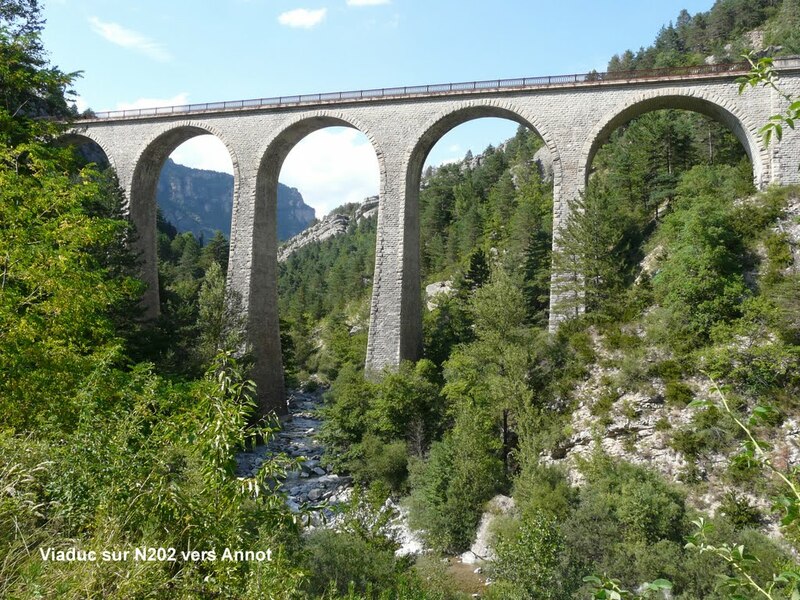 The same viaduct but this time showing its full height. 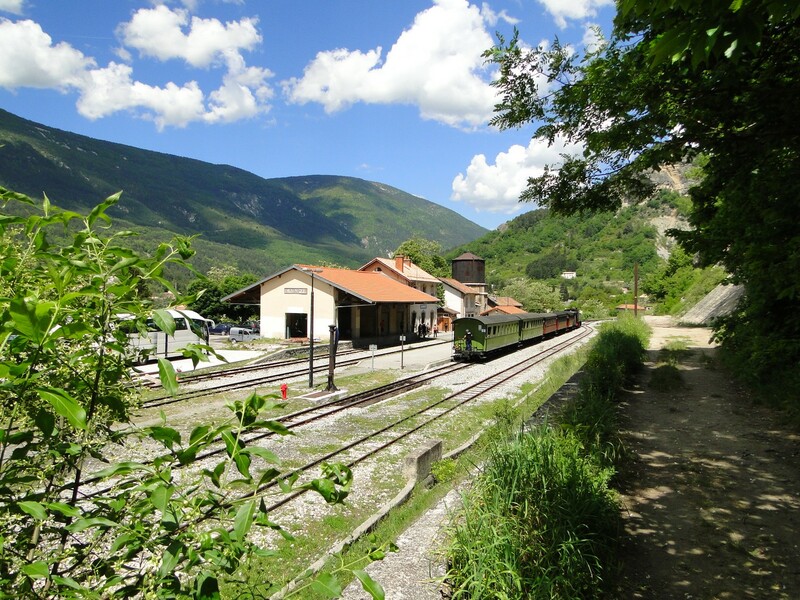 And below, another view of a steam train, this time travelling away from Annot. 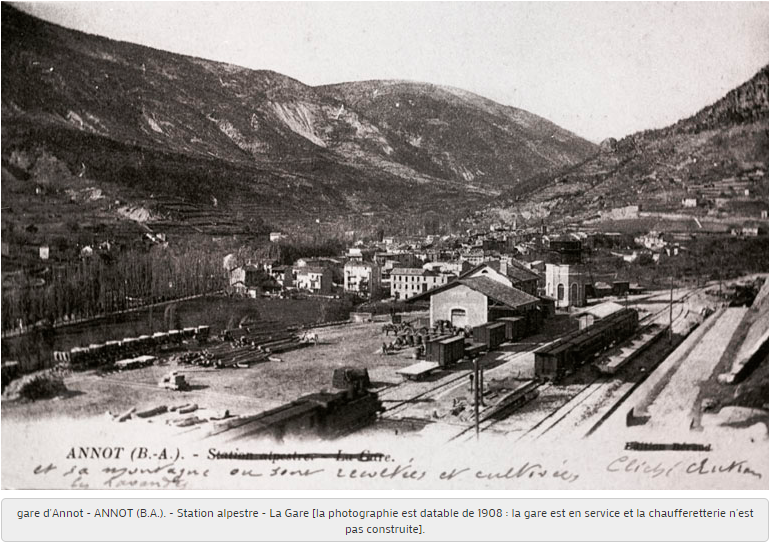 A short distance to the west of the viaduct, trains plunged into another tunnel – Galerie des Scaffarels. 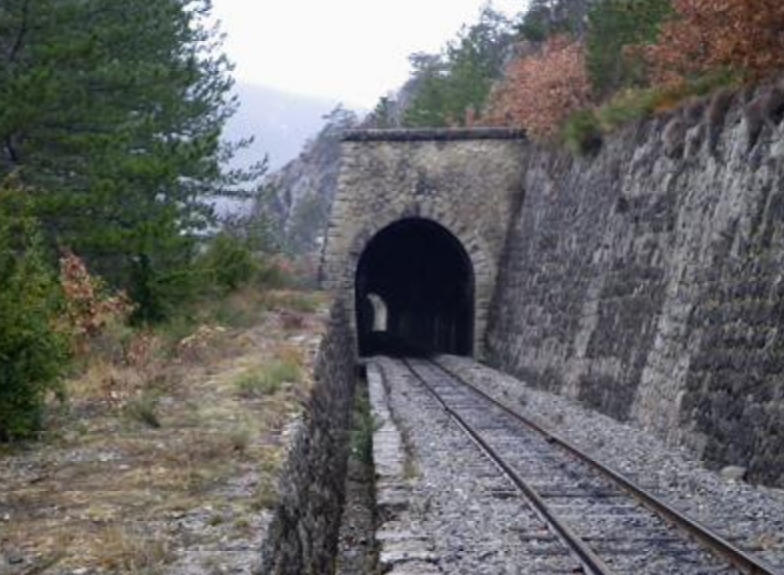 This was a protective structure avoiding the worst effects of rock and snowfalls. 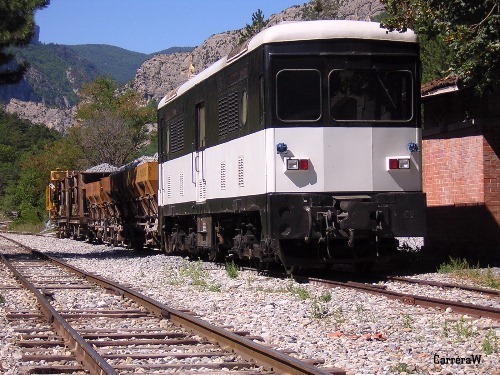 It was 151 metres long. 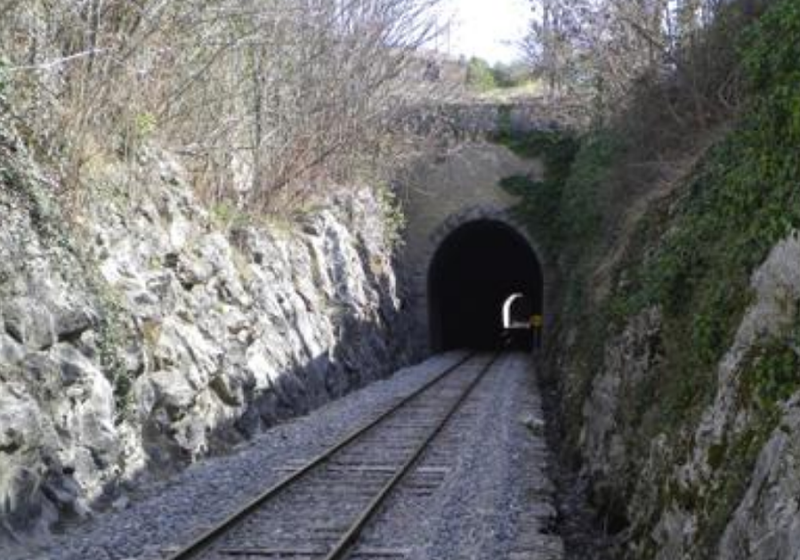 The first two images below are taken from the East looking at the tunnel portal. 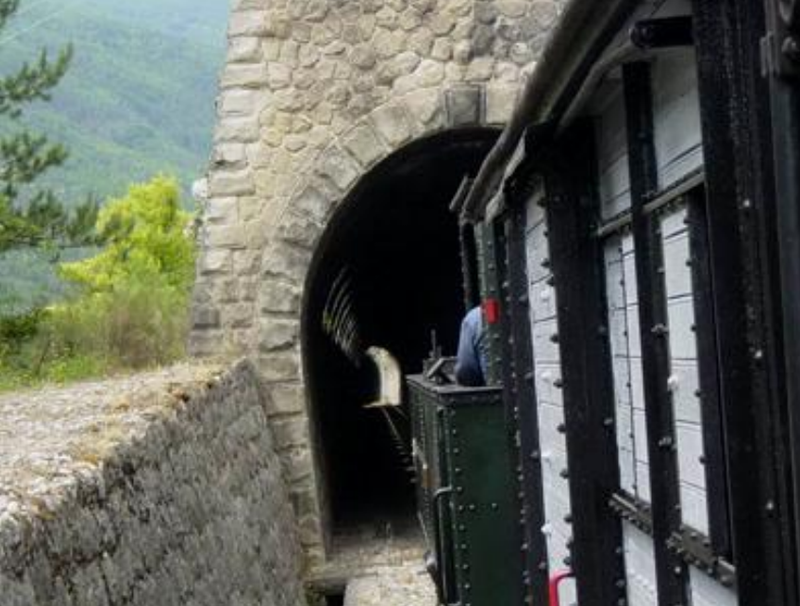 The third image is taken inside the gallery and shows the small arched openings in the south wall of the gallery. 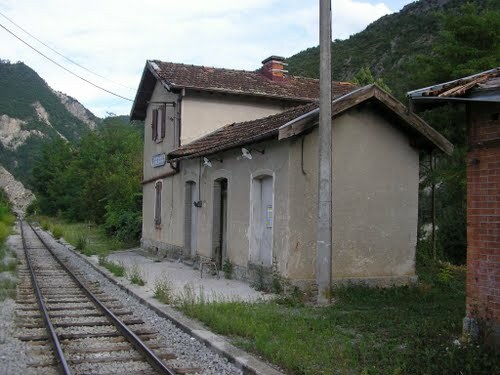 The fourth image below shows the western portal of the gallery. 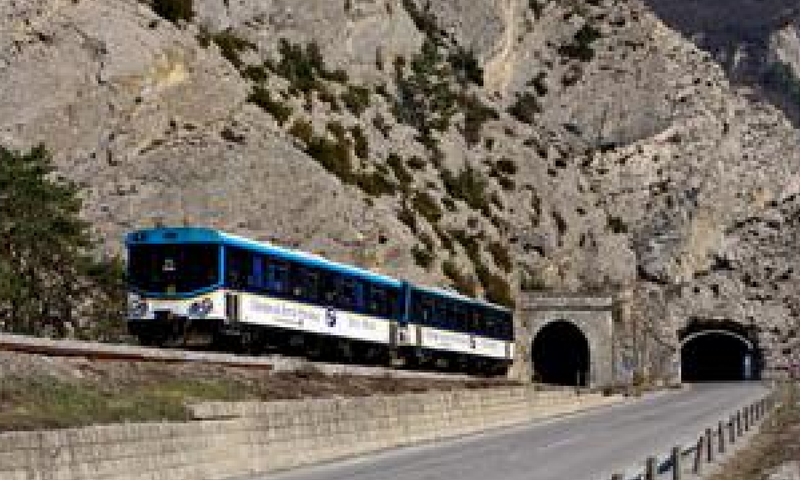 The gallery is immediately followed by a 207 metre long tunnel – Tunnel des Scaffarels. 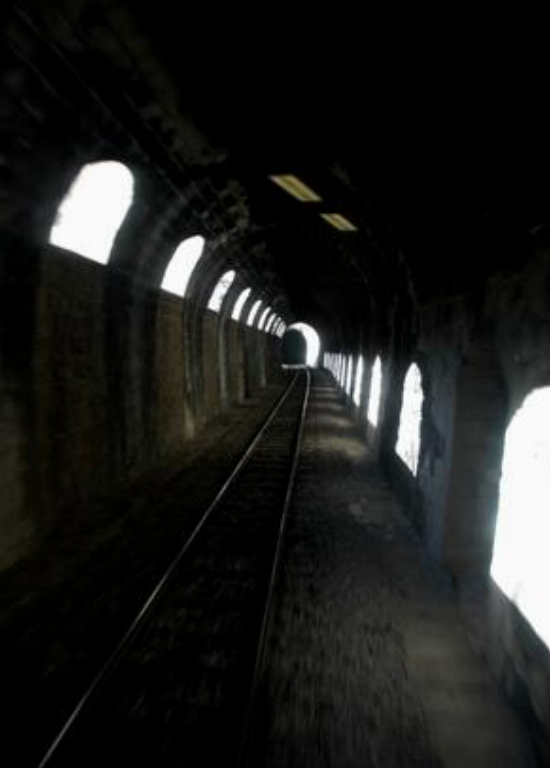 The first two images below are taken from inside the gallery and show just how close the two structures are to each other. 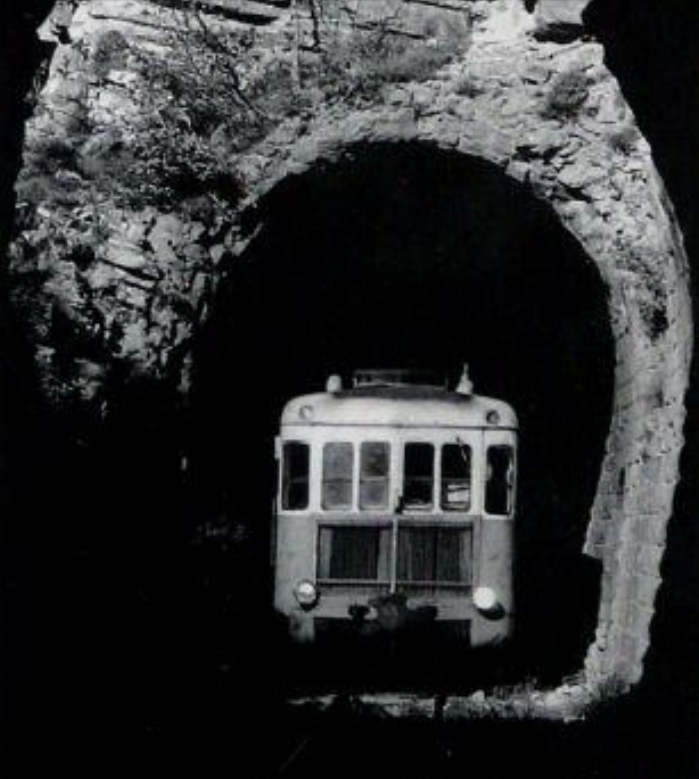 They depict the eastern portal of the tunnel. 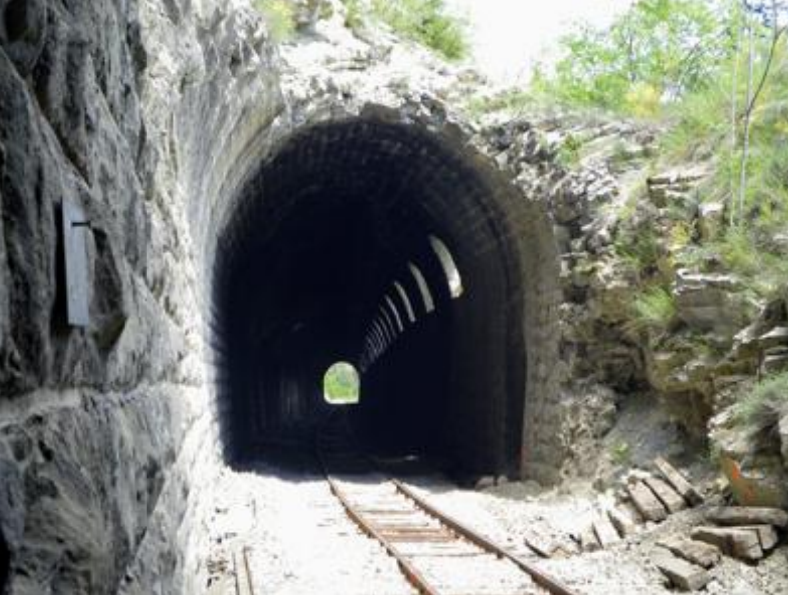 The third photo below shows the western portal in cutting. 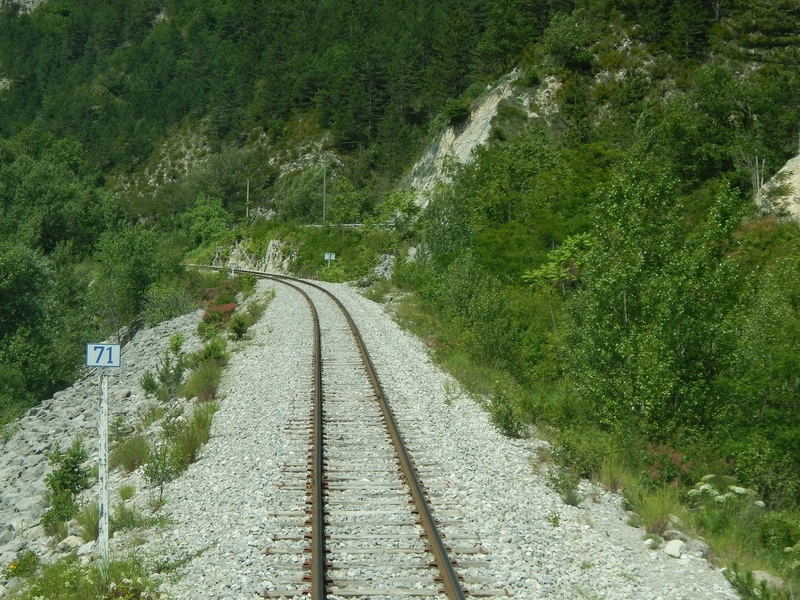 The 100 metre cutting gives way yo open land and the line immediately encounters another halt – Les Scafferals. 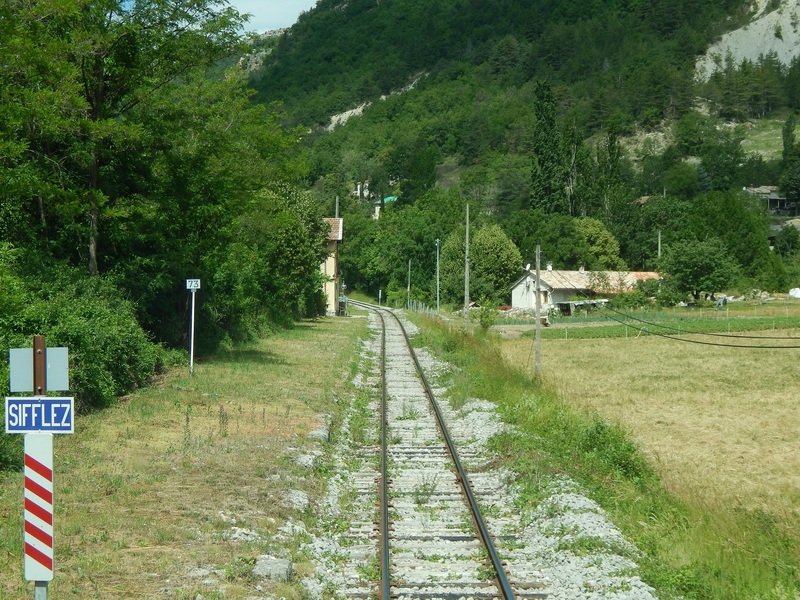 400m metres after the halt at Les Scafferals, the line begins to swing round to the northwest and in a further kilometre or so the Station of Annot is encountered. 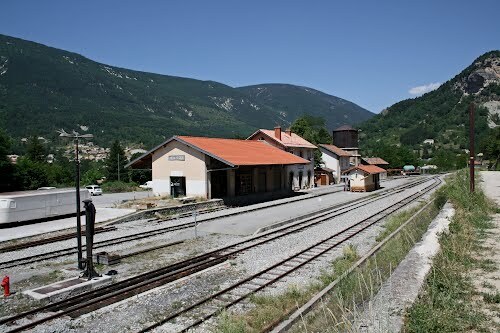 Annot functions as the usual terminus of the GECP steam services from Puget-Therniers. 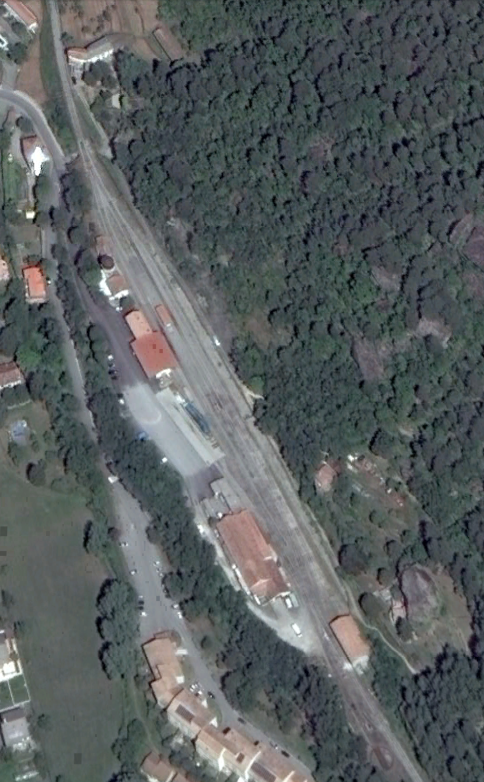 The station is shown in plan on the adjacent satellite image. 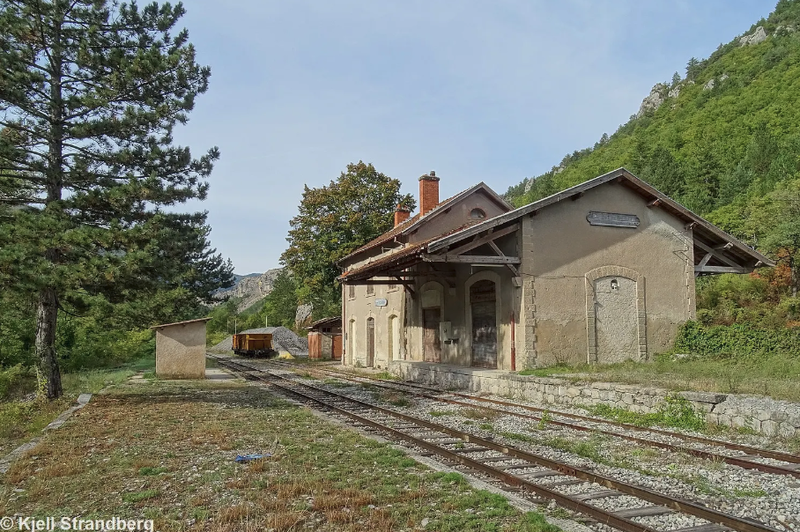 We finish this section of our journey from Nice to Digne at Annot station and with a few different vies of the station taken at different times in its history. 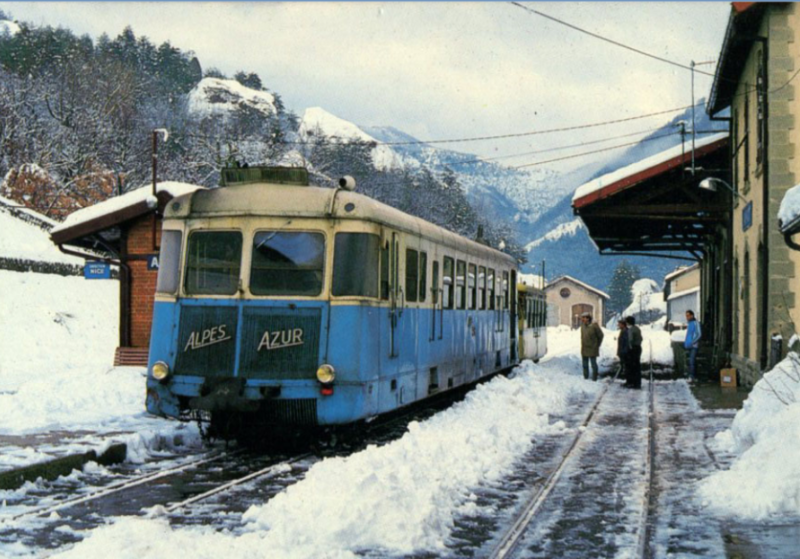 The next photograph below shows a Renault ABH railcar and Billard trailer in the snow at Annot station in 1987 (Pierre Boyer Collection). 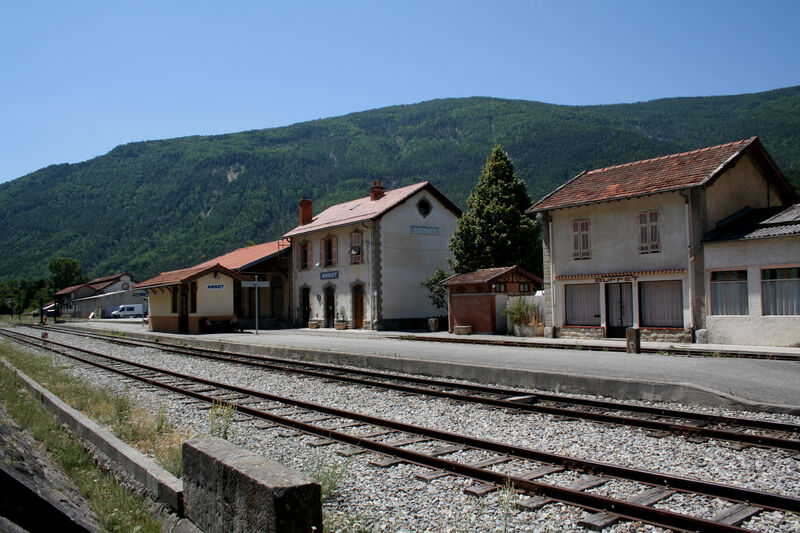 https://www.google.co.uk/maps/place/Saint-Beno%C3%AEt+Pont+de+Gueydan/@43.967581,6.75664,17z/data=!4m13!1m7!3m6!1s0x12cc41f9dc0aa187:0xf10a773ab9badd02!2sPont+de+Gueydan,+04240+Saint-Beno%C3%AEt,+France!3b1!8m2!3d43.969065!4d6.7597711!3m4!1s0x12cc41fbe0e4fe7d:0x425b3824df9b5b03!8m2!3d43.9678859!4d6.7570404, accessed on 26th July 2018.
https://www.cparama.com/forum/pont-de-gueydan-cne-de-saint-benoit-t28160.html, accessed on 20th July 2018.
https://mapio.net/a/60593367, accessed on 26th July 2018.
http://sierm.eaurmc.fr/surveillance/eaux-superficielles/etat-qualitatif.php?station=06710029, accessed on 26th July 2018.
http://www.rd-rail.fr/1-PHOTOS/PH43/index-ph43.html, accessed on 26th July 2018.
http://trip-suggest.com/france/provence-alpes-cote-d-azur/ourges, accessed on 26th July 2018.
https://www.google.co.uk/maps/place/Saint-Benoit/@43.960033,6.727445,3a,75y,90t/data=!3m8!1e2!3m6!1sAF1QipMXVem6e6mYYcyxeYWboq42DYz51wFSABmPfpoI!2e10!3e12!6shttps:%2F%2Flh5.googleusercontent.com%2Fp%2FAF1QipMXVem6e6mYYcyxeYWboq42DYz51wFSABmPfpoI%3Dw129-h86-k-no!7i1500!8i1000!4m13!1m7!3m6!1s0x12cc41f9dc0aa187:0xf10a773ab9badd02!2sPont+de+Gueydan,+04240+Saint-Beno%C3%AEt,+France!3b1!8m2!3d43.969137!4d6.759779!3m4!1s0x12cc6a3dfd6d4f0b:0xfc663905836cc5!8m2!3d43.9600332!4d6.7274449, accessed on 26th July 2018.
http://www.tunnels-ferroviaires.org/tu04/04174.2.pdf, accessed on 26th July 2018.
http://www.cparama.com/forum/saint-benoit-t28171.html, accessed on 18th July 2018.
https://entrepierres.net/wiki/Pont_Reine_Jeanne, accessed on 27th July 2018. 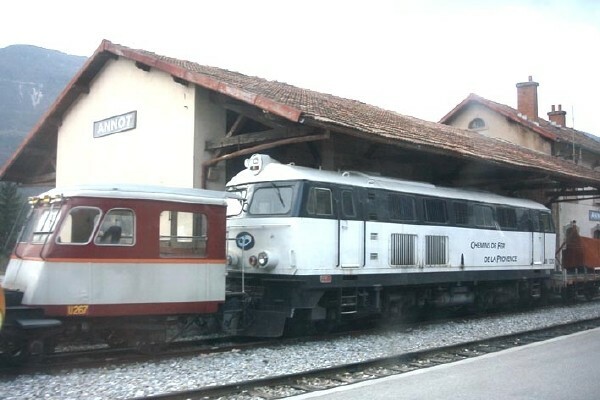 This image has been saved on my computer for a while and I cannot find details to attribute it. I’d be very happy to do so should someone contact me with details. 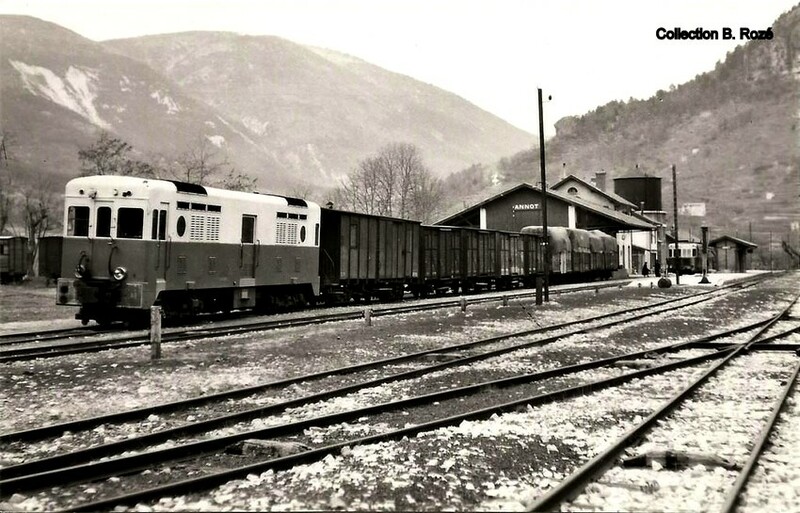 http://www.tunnels-ferroviaires.org/tu04/04174.1.pdf, accessed on 27th July 2018.
https://trainmec.blogspot.com/2016/01/la-portuguese-moving-in-steam.html, accessed on 27th July 2018.
http://www.proxiti.info/photoscommune.php?o=04174&n=Saint-Beno%C3%AEt, accessed on 27th July 2018.
http://www.cartophilie-viroflay.org/article.php?id_article=163, accessd on 27th July 2018.
http://www.tunnels-ferroviaires.org/tu04/04008.2.pdf, accessed on 27th July 2018.
http://www.tunnels-ferroviaires.org/tu04/04008.1.pdf, accessed on 27th July 2018.
https://en.wikipedia.org/wiki/Annot, accessed on 27th July 2018.
http://www.en-noir-et-blanc.com/rch-k1-171879.html, accessed on 27th July 2018.
http://www.map-france.com/Annot-04240/photos-Annot.html, accessed on 27th July 2018.
http://jan-san-climbing.blogspot.com/2017/05/annot-trad-climbing.html, accessed on 27th July 2018.
http://www.ravnsbak.dk/Railways/France/Railcars/Narrow%20gauge%20railway%20Nice%20Digne/index.html, accessed on 27th July 2018.
https://mapio.net/pic/p-7389278, accessed on 27th July 2018.
https://mapio.net/pic/p-80055650, accessed on 27th July 2018. 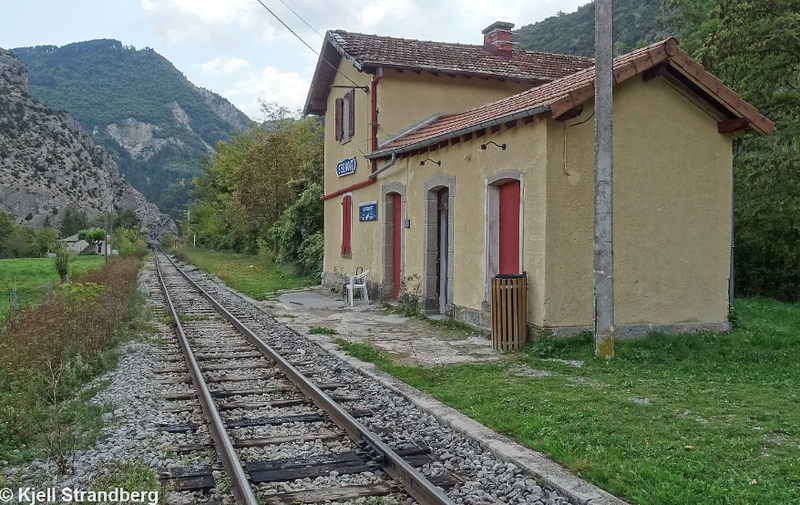 This entry was posted in Railways and Tramways Around Nice, Railways Blog on July 27, 2018 by rogerfarnworth.